TLB has propagated a lot of information heralding the use of GMO foods as an alternative delivery system for vaccines, but also using atmospheric spraying (chemtrails) to bypass the rising awareness and push-back of people like you and I, is a subject we do not discuss enough, and it is a reality. You WILL be subjected to the mechanism of vaccines whether you like it or not! 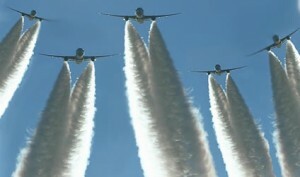 Over the past decade, independent testing of the chemical fallout of atmospheric spraying (chemtrails) around the country has shown a dangerous and extremely poisonous brew that includes (but is not limited to): nano sized aluminum particles, mercury (yea I said that), radioactive thorium, cadmium, chromium, nickel, desiccated blood (which may or may not contain a myriad of specific viruses), barium, mold spores, yellow fungal mycotoxins, ethylene dibromide and other unidentified organic materials. Put aside for a moment the extreme danger of these nano sized particles of extremely toxic metals we are breathing in (you literally have no choice), and the fact that our fluoridated water facilitates the movement of these toxic metals across the blood brain barrier (FACT) and consider this – Look at the (I’m sure incomplete) list of ingredients found by validated independent testing of Chemtrail fallout and tell me … do you recognize any from your research of vaccine ingredients? Do you believe this to be just a coincidence? Why do you need desiccated blood (which may or may not contain a myriad of specific viruses), mercury, mold spores, yellow fungal mycotoxins, ethylene dibromide and other unidentified organic materials to reflect sunlight and cool the earth as is the stated mission of atmospheric spraying or Geo-Engineering … answer … YOU DON’T! Attached you will find a comprehensive article first published in 2012 that ought to have raised some serious concerns in all of us. This is something we should be discussing in earnest now, but we are not! 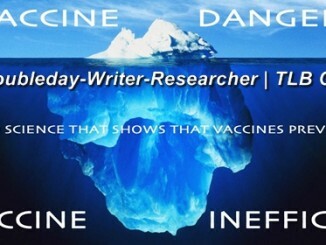 Why, because this is not public knowledge and is not even widely disseminated among those of us who push back so hard against the evil of vaccines and it surely needs to be! This article will go much further in explaining the relatively unknown (to most of the uneducated or unaware public) mechanisms for the delivery of vaccines. – Weather Modification. – Vector Control (insects, virus, and other similar vectors). – Mass Inoculations of the Public. Aerial vaccines are also directed towards animals by the use of plastic packets dropped by planes or helicopters. Sanofi (who is one of the largest vaccine manufacturers in the world) has subsidiary companies such as Merial Limited who manufacture Raboral, an oral live-virus poisonous to humans yet distributed wildlife in the masses. “In the United States, more than 12 million doses of RABORAL V-RG vaccine are used each year. Since the first use of RABORAL V-RG in the late 1980’s, more than 100 million doses have been distributed around the world.” At the beginning of the year, a KVUE news report indicated that the Texas Department of State Health Services would initiate an aerial vaccine drop of 1.8 million doses in January alone. Raboral V-RG is a poison because according to the material safety data sheet its ingestion, parenteral inoculation, droplet or aerosol exposure to mucous membranes or on broken skin is considered a health hazard exposed to infectious fluids or tissues. Under the mandate for aerial spraying for specific vectors that pose a threat to human health, aerial vaccines known as DNA Vaccine Enhancements and Recombinant Vaccine against WNV may be tested or used to “protect” the people from vector infection exposures. DNA vaccine enhancements specifically use Epstein-Barr viral capside’s with multi human complement class II activators to neutralize antibodies. Â The recombinant vaccines against WNV use Rabbit Beta-globulin or the poly (A) signal of the SV40 virus. In early studies of DNA vaccines it was found that the negative result studies would go into the category of future developmental research projects in gene therapy. During the studies of poly (A) signaling of the SV40 for WNV vaccines, it was observed that WNV will lie dormant in individuals who were exposed to chicken pox, thus upon exposure to WNV aerial vaccines the potential for the release of chicken pox virus would cause a greater risk to having adult onset Shingles. Doug Dorst, a microbiologist and vaccine critic in South Wales, says these advances have an immense appeal to vaccine makers. “Biotech companies and their researchers have quickly moved most funding initiatives towards nanotechnology to increase the potency of their vaccines,” he said. If microorganisms inside of vaccines can be coaxed into targeting or invading specific cells, they could achieve their goal at an accelerated rate over conventional vaccines. “Depending on which side of the vaccine debate you’re on, whether pro or con, nanobots inside vaccine preparations could advance their effectiveness exponentially by either dramatically improving or destroying immunity depending on their design,” he added. TLB recommends you visit Prevent Disease for more great/pertinent articles and information. If you want to be taken seriously and be considered a reputable “beacon” of truth, don’t use godlikeproductions as reference. They are an absolute detriment to the truth movement and absolute bs fear mongering website to whom many of the articles they have posted have been debunked. They post Sorcha Faal stories for christ sake! The whole arena of BS associated with the chem-trails leaves out one important thing. Karry Casidy’s investigations have uncovered that the materials being sprayed are enclosing every cell in every body so the cells can not breath, literally we will be smothered to death. Nano and BioAPI Phases One and Two. They tells us in the movies,cartoons and music about chemtrials, mindcontrol and Morgellons. This site is outside the box. A must read! Herald: The article was updated extensively (over 80%) on 11/27/14 … But originally published in March. All given disgust at this very real madness aside ~ if this article was just published on 11/27/14….why are there comments beginning in March 2014? And We The People are paying for this clever poisoning. Its all done using additives to jet aviation fuel, under the guise of cost benefits to the Aviation industry. And, that toxic soup gets disbursed everywhere they fly – mostly in and around our most heavily populated areas. The article & cause for concern is real & grave. There has to be mass awakening soon. Trolls are all around spreading their disinformation / misinformation & marginalizing real concerns. Humanity needs to awaken ASAP. It is government doing things like this that cause violent revolutions and rightfully so! Regarding the FunVax (Fundamentalism Vaccine) which supposedly blocks expression of VMAT2 (“the God gene”) there have been people who have pointed out that the original video about that was faked. But, of course, creating an obviously fake video about a topic they want to cover up, is an effective method of shutting down discussion of the topic, because they can always say, “oh, that was debunked” but in reality, it may be very well going on. Ignore who ? Thanks for posting a very pertinent and important, and obviously well informed article. Looking forward to Dave Hodges show with liberty beacon on. Please ignore A, who is either a shill or completely out to lunch as to what is happening out there.